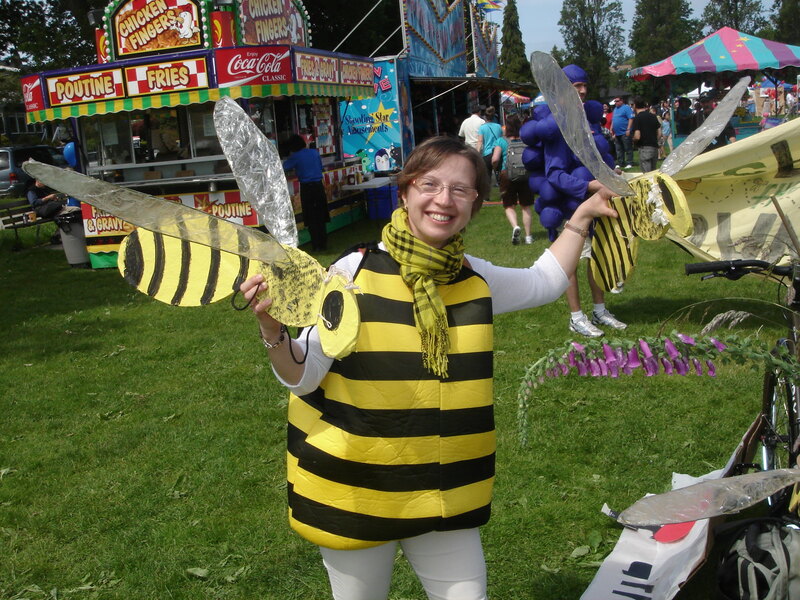 Pollinators, a pod of peas and people on parade! 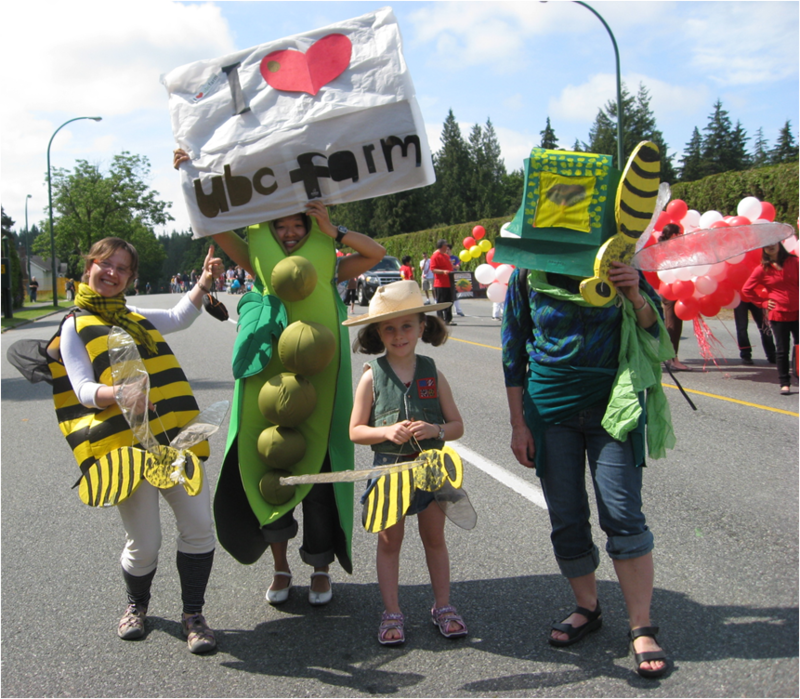 Thanks to everyone who cheered for Friends of the UBC Farm at the Point Grey Fiesta Parade last Saturday! It was a beautiful day for dressing up in our finest costumes, several of which were kindly loaned by the UBC Sustainability Office. Our troupe included a pod of peas, bunch of grapes, honey bee, cob of corn and some friendly farmers. Hats off to the Point Grey Fiesta Committee for organizing such a great community event. Photo contributions courtesy of Agnieszka and Julia. Family Day at the Farm! This Saturday, June 19th. Farm Biodiversity Tours – Come learn about life on the farm. Cows, chickens, bees and soil organisms are important members of the farm family. 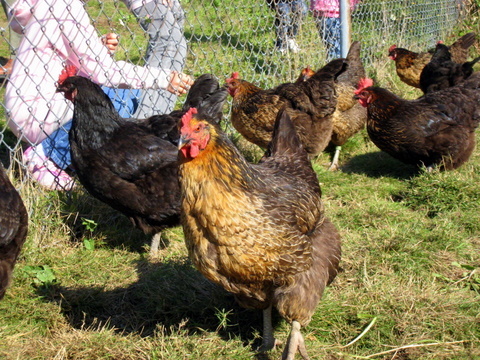 Attend one of these tours to learn a little bit about animal life at the farm. Tours start at 10:00am, 10:30am, 11:00am – Please meet on the hill above the market area near the picnic tables. Children’s Book Readings – Veronica from Barefoot Books will be doing several readings throughout the day. Barefoot Books offers many children’s books inspired by stories about people and the natural world around them. Book reading times will be at 10:30am, 11:30am and 12:00pm. Volunteers needed THIS SATURDAY, June 19th! 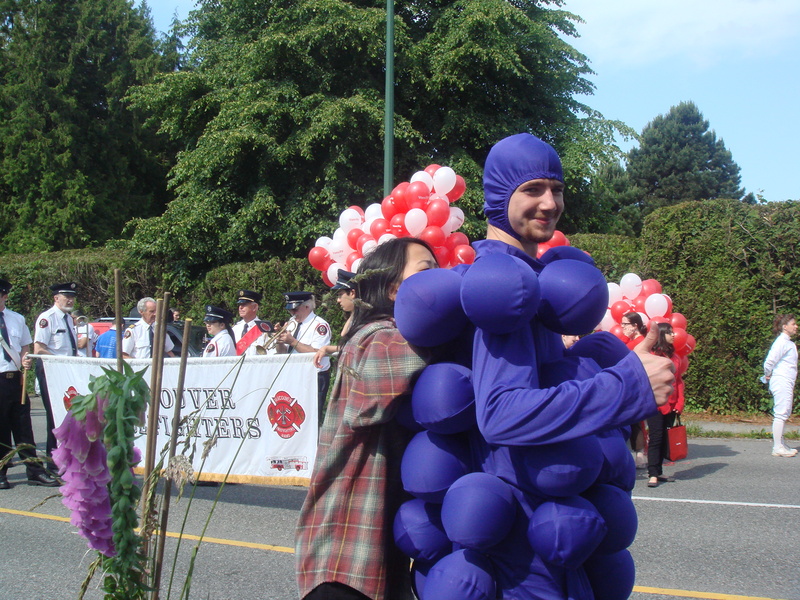 We still need people to join us this weekend at the Point Grey Fiesta Parade ! Location: Meet for parade at 10th and Blanca St. Details: We’re looking for adventurous UBC Farm supporters to join us as we march and cycle through the streets of the local Point Grey community! 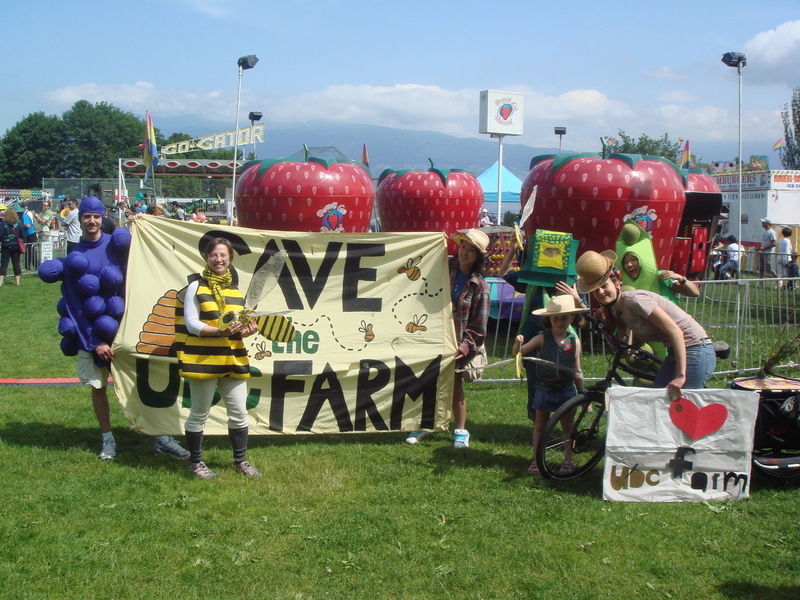 On Saturday, June 19th, Friends of the UBC Farm will be marching and trailing a UBC Farm banner by cargo bike in Fiesta Parade, the Point Grey neighborhood’s annual start-of-summer celebration. Fans of the Farm can join in, preferably by bike, but we welcome people on foot/scooter/wheelchair/roller blades/stroller etc. as well. We’ll be sporting some excellent veggie and farmer costumes, and we’ve got extras to share! We’re happy to have volunteers of all ages, and kids are especially welcome. In addition to the parade component, we also need volunteers to help staff our community outreach booth in Trimble Park following the parade. For more info about the festival, visit www.pointgreyfiesta.org. Please email Anelyse at friendsoftheubcfarm@gmail.com if you’d like to join in on the fun. Looking forward to marching with you! 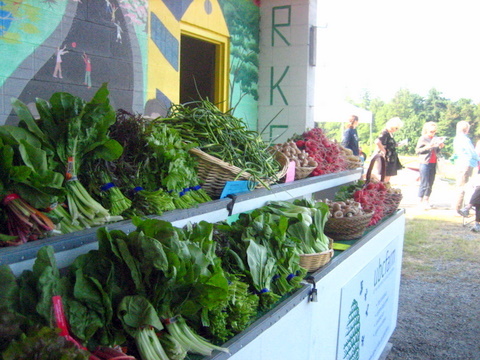 First UBC Farm market of the season – June 12th! What: The UBC Farm Market – selling local, organically-grown produce from the idyllic setting of a comlete working farm right in the city. Featuring a wide variety of vegetables, fruits, berries, herbs, and flowers plus eggs from our free-range hens. Welcome back dedicated market goers! We hope you are as excited as we are for the 2010 market season to start. It’s shaping up to be another exciting, fun-filled year at the farm, and we hope you’ll join us this weekend and many more. The name of the game this week is greens greens greens! We are very excited to offer an amazing assortment of green leafy veggies at market this week, including arugula, mizuna, ruby streaks, kale, chard, and spinach. Also – excellent supplies of our ever-popular salad mix – get it in the early season before the heat causes it to become scarce. Read on below for a full list of what to expect on the stands tomorrow. Our fresh herbs are also growing like mad, so it’s time to get creative in the kitchen! New this season – mixed herb bunches! At market this week we will have an ‘Italian Herb’ medley including oregano rosemary and thyme, as well as a ‘Hearty Herb’ medley including oregano, sage, thyme and savory. Unfortunately our young hens are not quite laying yet, so there will be no eggs at market this week. However, we anticipate having them soon – stay tuned! This season, we are also excited to announce that we’ll be be hosting weekly pubic tours at the markets; see below for details. In addition to the general tour this week, our resident bee expert Alan Garr will be doing a bee hive opening at 11:30am. We also have about 10 other vendors joining us for our opening market offering a variety of products – see the link below to an interactive map listing who will be here. Please read on below for details – see you at the Farm! Payment information: Cash is the preferred (and quickest!) method of payment at the market. We are unable to process Interac or credit card transactions. We’ll accept cheque payment for purchases over $30. Many vendors only accept cash, so make sure you are prepared for the day! Parking: Please park outside the farm gate in the lot or along South Campus Road. Three spots in our parking lot are reserved for persons of limited mobility. As parking space is limited, it’s even better if you can carpool, bus, bike or walk to the farm! See our website for directions. Please drive carefully along South Campus Road and watch for pedestrians, children and cyclists! Bike racks are available inside of the farm gates. Plastic bag charge: In order to reduce our consumption of plastic and lessen the ecological footprint of our market, we charge customers 10 cents per plastic produce bag used. (This charge is for the tear-off roll bags and not for pre-bagged items). We encourage you to bring your plastic produce bags back and reuse them and let our cashiers know this. Thanks for your support in this effort! Bring your own shopping bags! In addition to reusing your produce bags, please make sure to bring your own shopping bags to pack your purchases in and take them home. We will gladly accept donations of clean, used grocery bags to have on hand. Eggs: No Eggs this week! When the hens start to lay (in the next couple of weeks), egg quantities will be limited (the hens can only produce so much!) and so we will continue our limit of one dozen eggs per family. Line-ups: We operate on a first-come, first serve basis, therefore line-ups may take 30 minutes or more when the market first opens at 9am. Please visit us after 10:00am for much faster service. Some specialty items such as eggs and berries may be sold out, but we maintain a great selection of veggies all through the morning We greatly appreciate your patience with this matter! This season we have attempted to expand our vendor base, so please help us support these local producers! We are using a great new online market support system which allows us to share with you an interactive market map to view who will be attending the market each week and what you can expect them to be selling! Please check back each week to see what other goodies you can set your eye on! Also at the markets this season, a Vancouver based non-profit group with UBC connections – the Southeast Asian Archaeologists (SAA) – will be collecting donations to help rebuild a Cambodian university badly damaged in that country’s wars. Visit their stall from 10am-1pm each week to drop off items, and see their flier (PDF) for a full list of donations sought. UBC Farm friends might be interested in this upcoming Greenest City public consultation event, which will include an address on local food in the Vancouver region. For more details about Pecha Kucha nights, where local instigators are on stage delivering and inspiration and insight through 20 images, each shown for 20 seconds, visit pecha-kucha.org/night/vancouver. Check out this article from UBC Public Affairs about the exciting Think&EatGreen@School Project! The interdisciplinary research team involved in this initiative includes investigators from the UBC Farm.